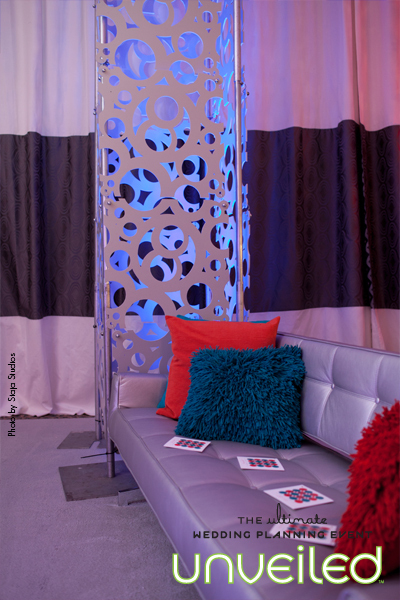 Inspired by the mid-century modern resurgence, we envisioned a throwback to the 1960s. 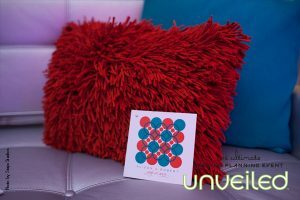 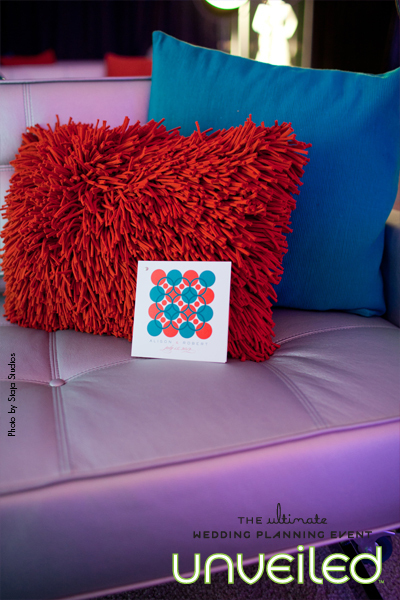 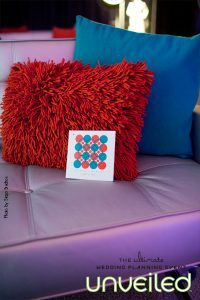 Sub-atomic vibes, retro-inspired color palettes, shapes and finishes would all play a strong influence in our design. 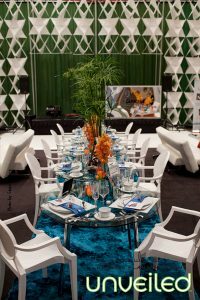 Thinking of the Jetson-like modern interiors of Eero Saarinen and the new Bakelite plastics of the era, we infused the scene with modern interpretations of these bygone elements. The effect could be summed up in one word: MARTINI. With inspiration like MARTINI, it’s hard not to think about the party. 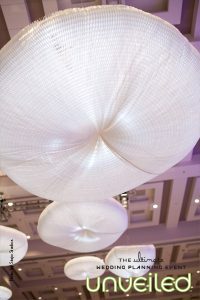 The reception space would feature an elongated head table constructed from round glass tables placed in a gentle ‘S’ curve over a Cockatoo colored shag rug. We selected sleek white Louis acrylic armchairs which are reminiscent of the Bakelite plastics of the 1960s. 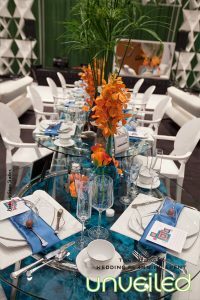 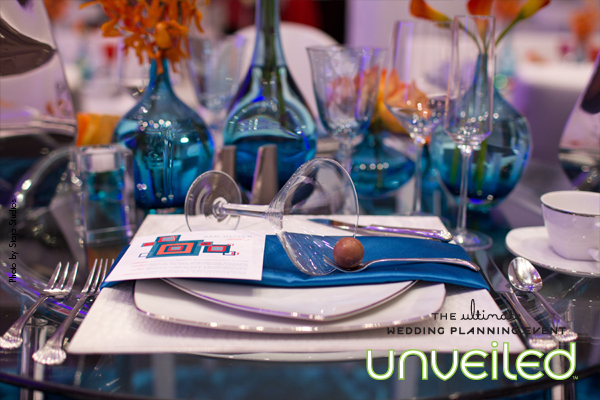 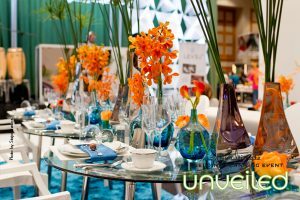 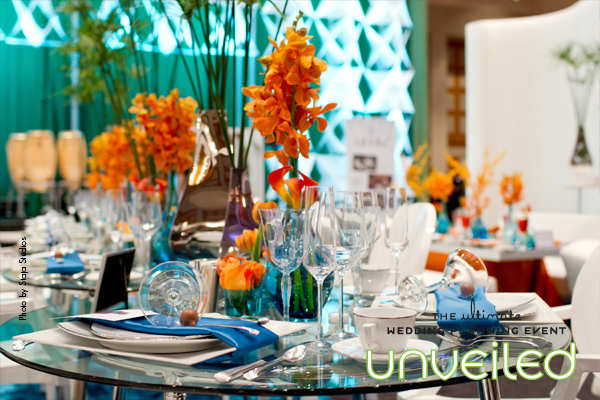 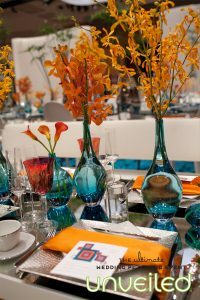 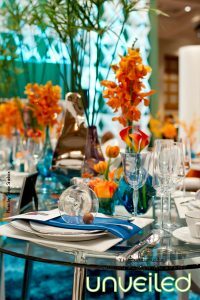 The tablescape featured bulbous blue vases with a variety of orange orchids that accented the room, as well as silver metal vases and palm fronds. 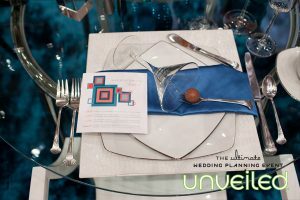 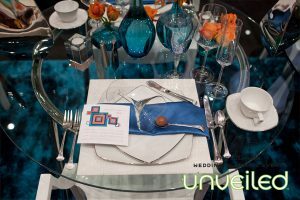 The head table was styled with Cockatoo colored satin napkins, embellishing the setting with overturned martini glasses and a chocolate favor to mimic an olive, placed on a silver cocktail fork, at left. 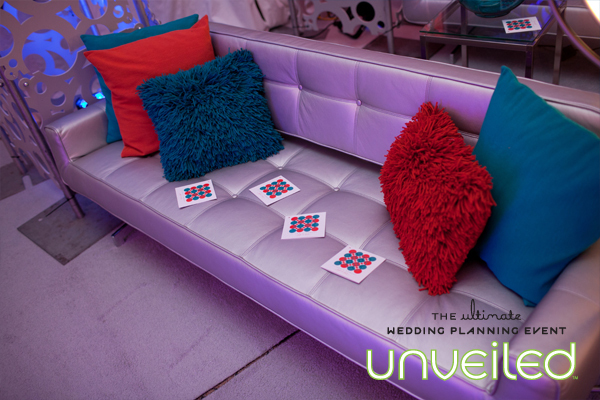 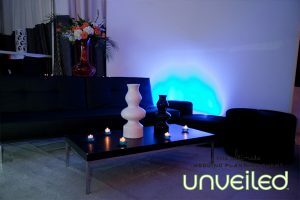 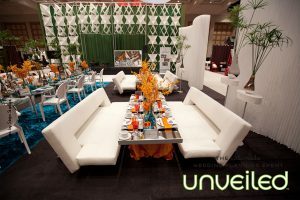 The guest tables were flanked by white leather sofas. 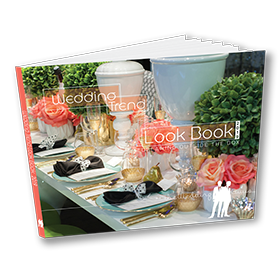 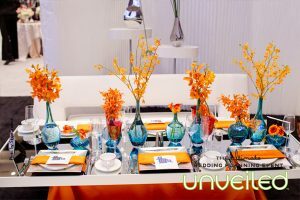 Orange linens flowed beneath the mirrored tabletops that reflected the designer table elements as we repeated the head table centerpieces, adding in orange calla lilies. 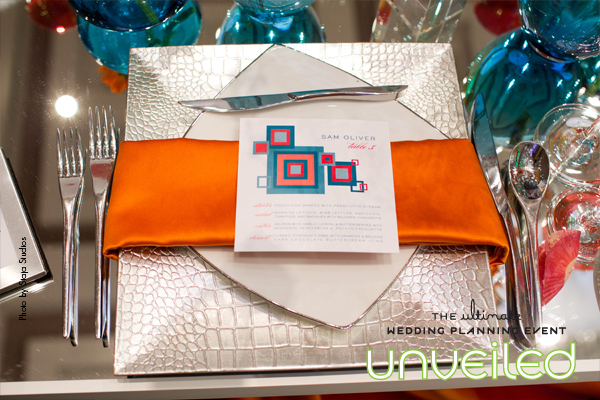 The place settings featured square silver crocodile chargers and crisp silver edge white china. We wrapped the place setting with an orange silk napkin and placed the square menu card upon it. 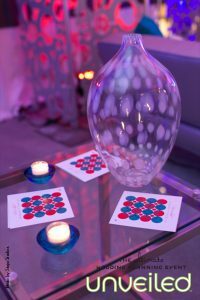 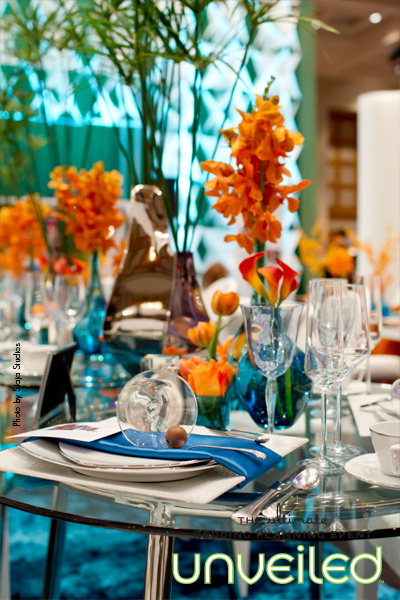 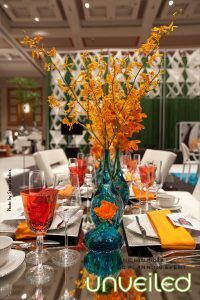 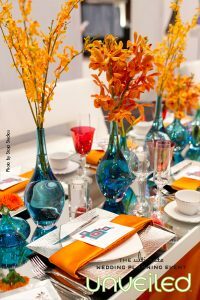 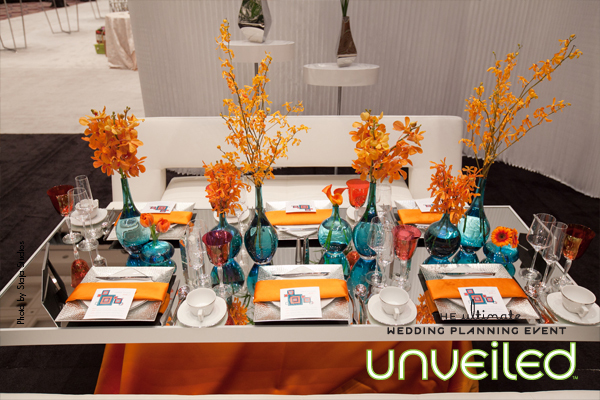 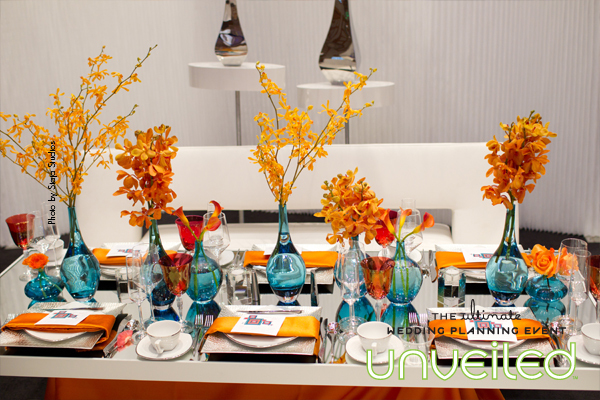 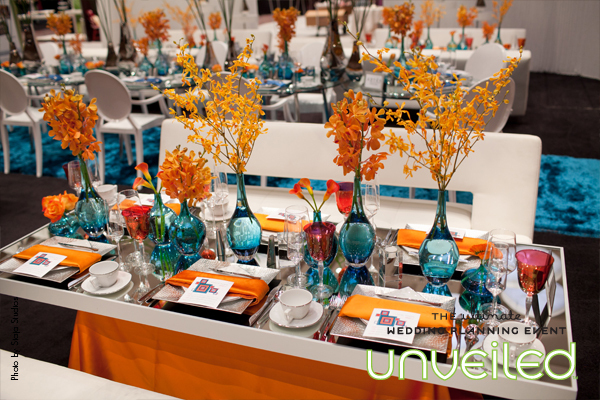 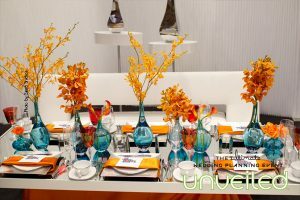 More color was added to the table with the use of colored stemware in a deep orange. 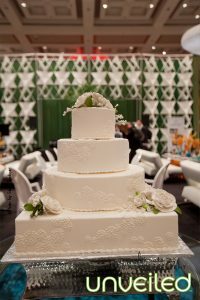 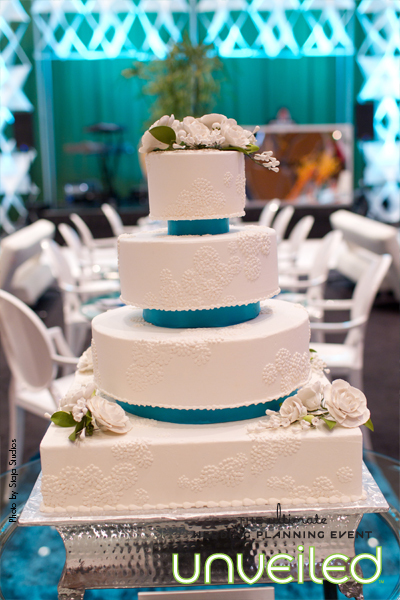 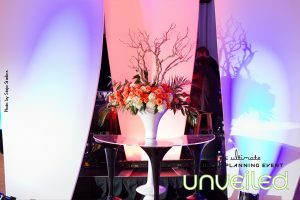 The entire reception was surrounded with white paper walls that curved around the tables. 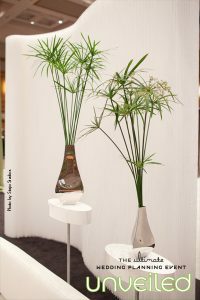 Throughout the space, we added more interest with additional silver vases placed on white gloss pedestals, which featured more palm fronds. We placed a gloss white dance floor and a stage for the band at the edge of the long head table. 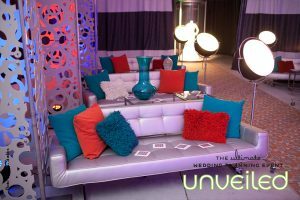 By adding in more white leather sofas, we provided extra space for guest to lounge and enjoy the entertainment while, of course, sipping on their martinis! 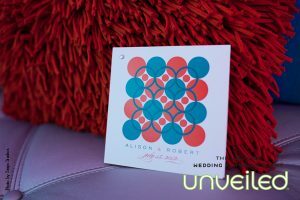 The ceremony would be set as a modern sanctuary highlighted with sleek tufted silver leather Adman sofas, creating the liner effect of church pews. 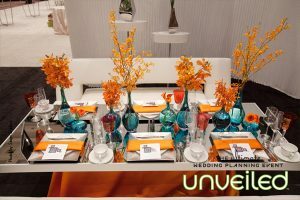 The sofas were dressed in shag and textured pillows in cockatoo and tangerine, while small square glass and chrome tables separated rows of sofas and provided space for 60s-inspired vases and accessories. 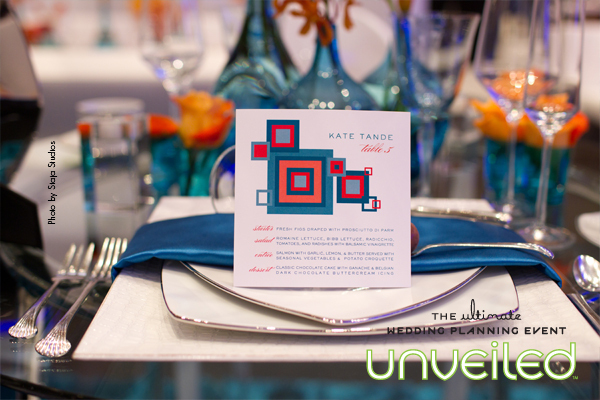 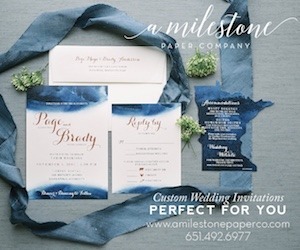 As the aisle created a statement piece with a boldly patterned runner, featuring our cockatoo and tangerine pallet, this geometric pattern would be replicated with a coordinating pattern which was featured on the multiple-page ceremony program and the menu card used for the reception. 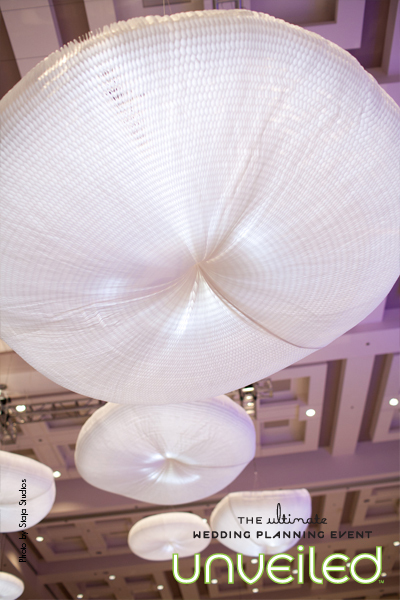 Suspended above the area were large paper urchin lights, which added a modern glow to the space. 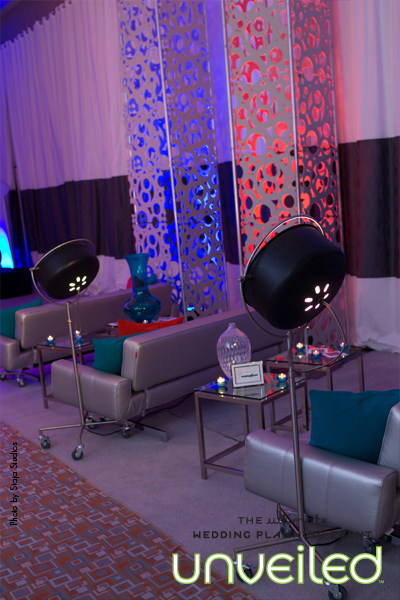 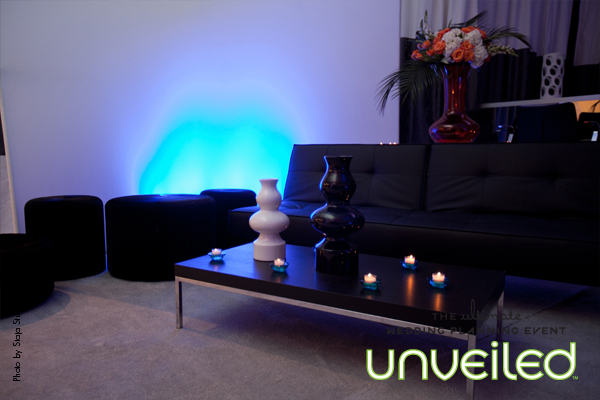 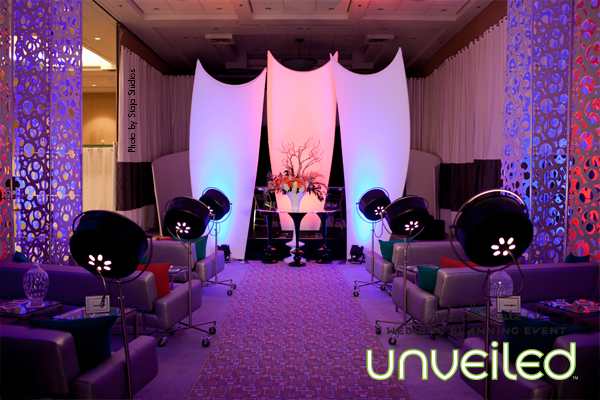 To enhance the overall atmosphere, we flanked the aisle with floor-standing Beacon lamps. The altar would be constructed with sloping spandex towers that were inspired by the 1960s interiors of New York’s JFK terminal. An acrylic altar would hold a myriad of modern glass cylinders with candles, while dramatic up lighting would accent the altar space and add interest. 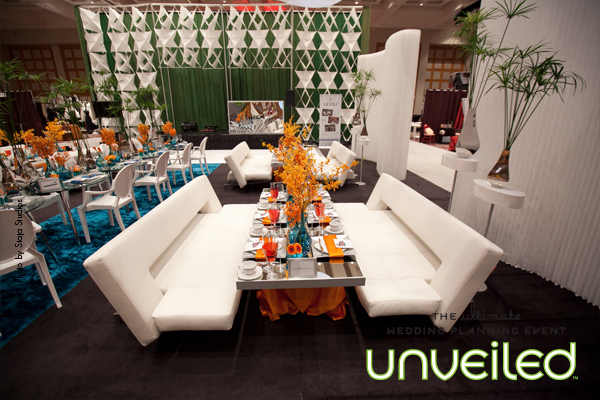 For the cocktail reception, we selected modern black leather seating. 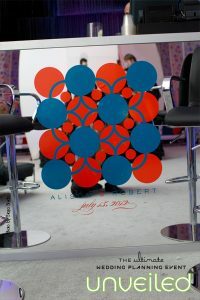 The seating included leather sofas and high-backed stools while a mirrored bar, featuring vinyl graphics, repeated the circular motif in cockatoo and tangerine. 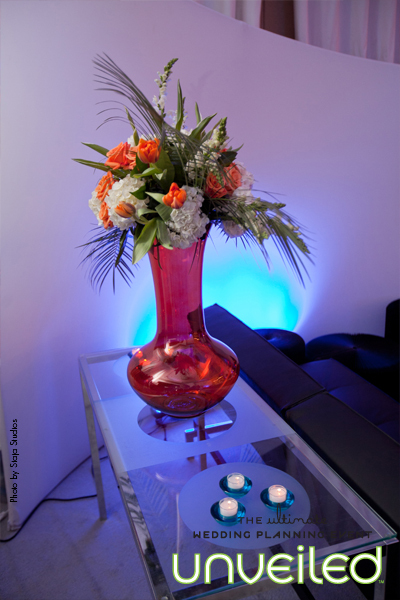 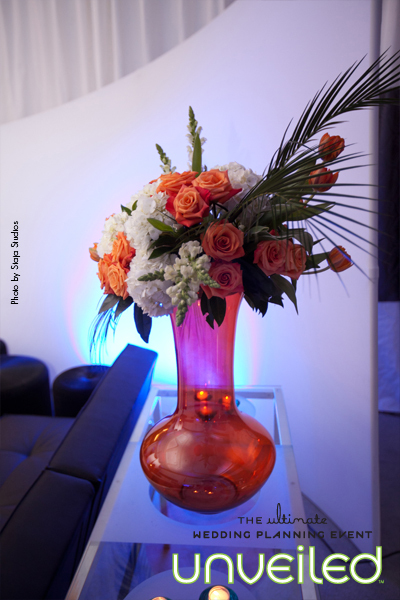 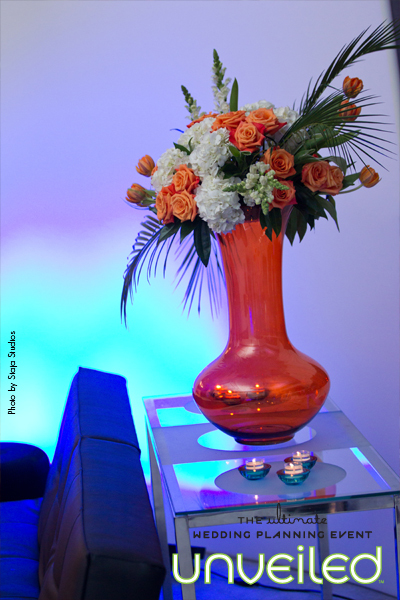 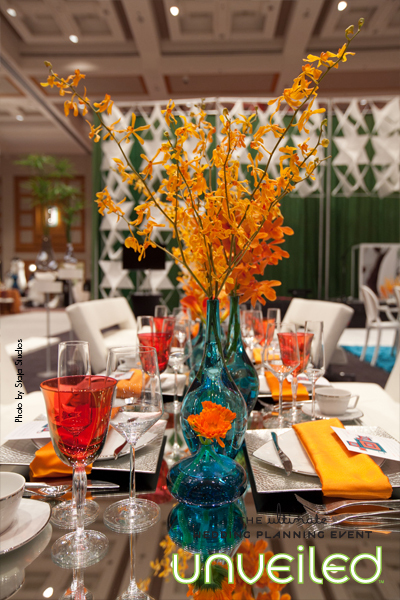 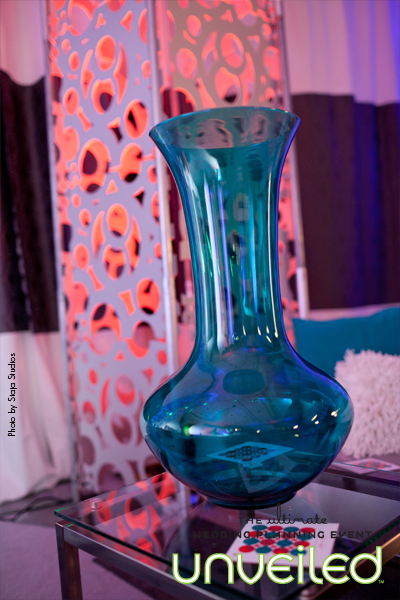 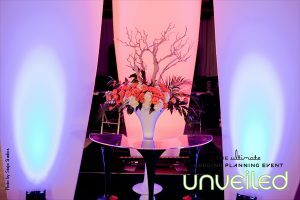 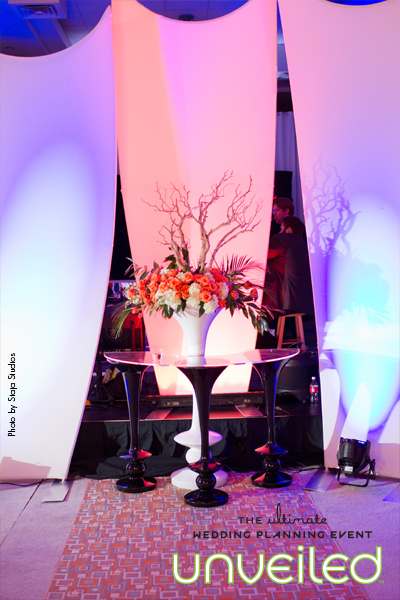 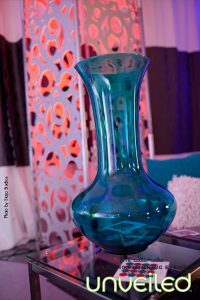 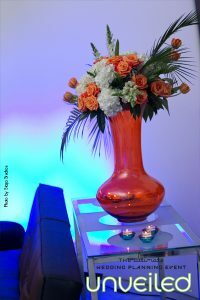 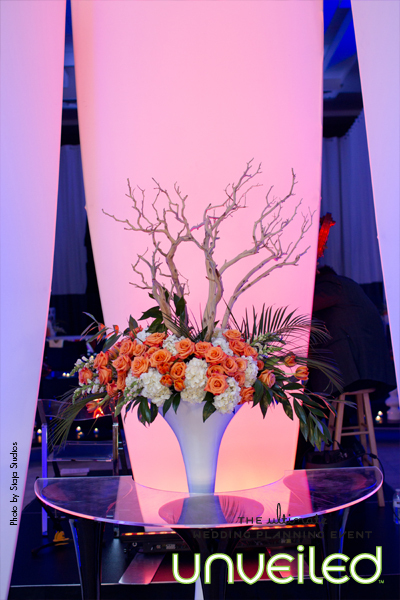 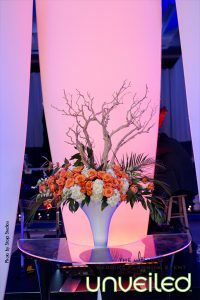 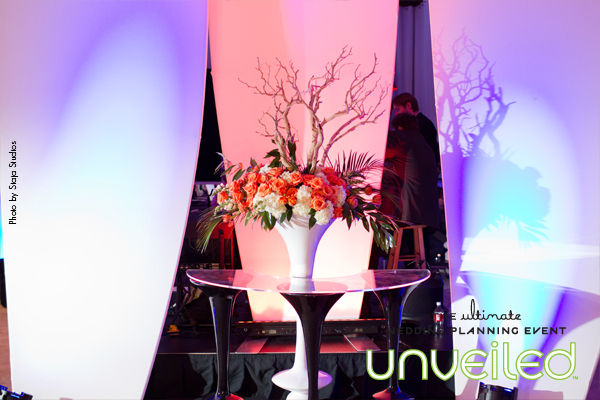 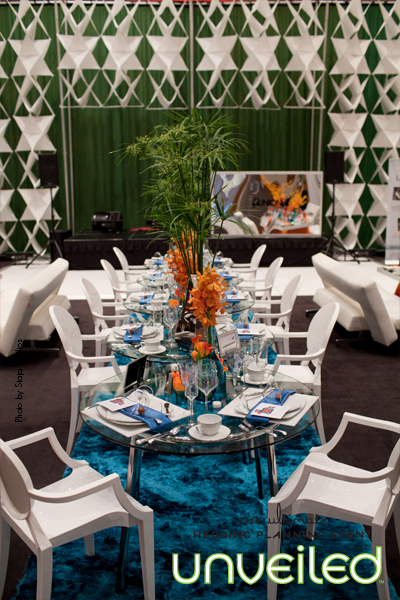 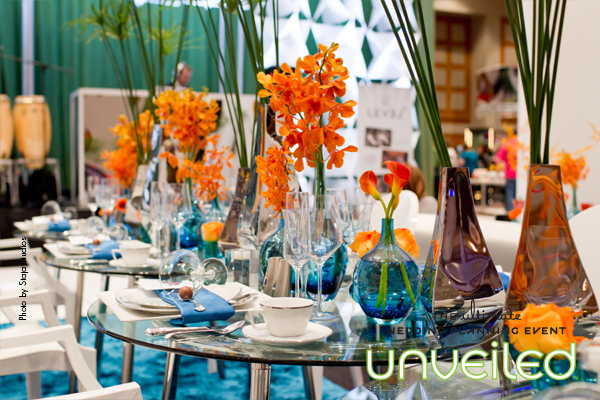 Oversized glass vases in the lounge showcased modern floral in orange with large leaf accents.